From Relais & Chateaux luxury to family-run guest houses, Chile’s hotel scene is more dynamic, and eclectic, than ever. 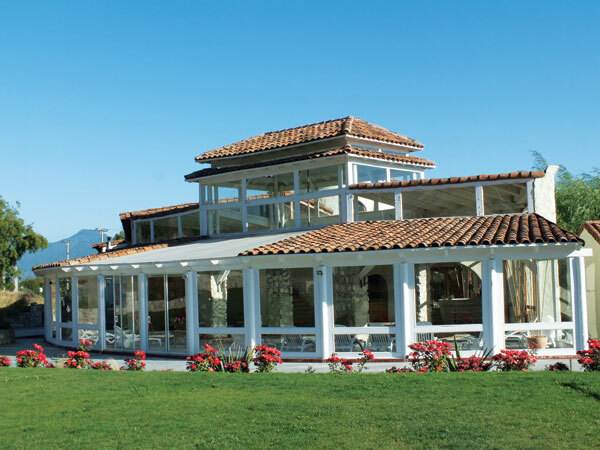 Regular visitor Peter Richards MW recommends top Chile hotels. My pool attendant was a fine example of the Chilean mastery of the understatement, and perhaps it’s understandable for a country so remote to be reticent when it comes to investing in costly infrastructure such as hotels and other tourist facilities. But some have recognised the great potential and attraction of Chile’s extraordinary landscapes, delicious food (fresh fruit, vegetables and seafood are a delight here) and fine wines. It is to be hoped that more are brave enough to follow suit. They can help open up Chilean wine country to visitors who might otherwise zoom straight off to the wonders of the Patagonian rock towers and Antarctic ice fields, or the breathless delights of the Atacama desert. The overall trends are positive. In 2012, international tourist arrivals to Chile grew by 12% on the previous year, reaching nearly 3.5 million. The World Tourism Organisation identifies Chile as the fastest growing tourist destination in Latin America. Encouraging developments include the VIK winery retreat in Cachapoal, slated for launch next year, while Tabalí is also considering opening up guest facilities in the lunar landscapes of Limarí in the north. For most international visitors, the capital Santiago is the first port of call in Chile. To explore wine country, the options are then to head north (towards Aconcagua, Limarí and Elqui), west (towards Casablanca and San Antonio) or south (towards Cachapoal, Colchagua and Maule). For now, there are limited options for those heading north – the main developments in boutique hotels to date have been in the centre and south. As Maipo is the wine region that surrounds Santiago, it’s the most logical place to start. Moving out of central Santiago, perhaps one of the best and most exclusive places to get a feel for Maipo’s historic wine production is at Santa Rita’s Casa Real Hotel. Make no mistake: this is old-school Chile. Don’t expect hi-tech installations or the latest in creature comforts. But the atmosphere is delightful in this well-preserved 19th-century estate house, with its airy colonial feel, high ceilings, wide verandas, sumptuous furnishings and creaky wooden floors. The facilities are more than adequate and the service attentive. 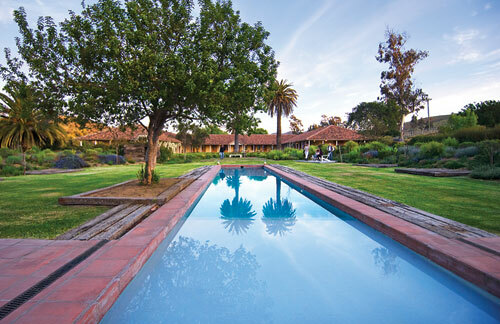 As well as the historic cal y canto wine cellars at Santa Rita, other attractions include the excellent Andean Museum, garden park, café, wine shop and a restaurant with a story to tell (the basement reputedly served as refuge for patriot fighters during the wars of independence). There are also plenty of other wineries nearby worth a visit too, such as Carmen, Antiyal and Pérez Cruz. A foray west of the capital is very much de rigueur for the wine-minded visitor to Chile, given the excellent quality and increasing diversity of the wines from San Antonio and Casablanca. In the former can be found Matetic’s Hotel la Casona (pictured right), a seven-room, sensitive refurbishment of a 1900s estate house. It’s a great place to get away from it all, within easy striking distance of the coast and in the beautiful, self-enclosed setting of the Rosario Valley, where Matetic practises organic and biodynamic farming to produce not only superb Syrah, but also succulent blueberries. A horse, bike or walking trip round the valley is recommended, and you can also combine a visit here with a stay in one of Chile’s most breathtaking natural parks. Wine & Nature is a six-day programme that takes advantage of shared ownership to link La Casona with Patagonia Camp in Torres del Paine (prices start from US$2,350 per person, which includes accommodation in luxury lakeside yurts; go to www.patagoniacamp.com for more information). Over the hills from Matetic is Hotel Casablanca Spa & Wine (pictured left). This family-run, 12-room hotel is elegantly proportioned and, as well as a sauna, hot tub and heated pool, offers grape-based ‘bio-active’ treatments featuring both bath and facial options. The hotel can also point you in the direction of local producers, of which there are many – its recommendations include Kingston, Montsecano, Casas del Bosque, Bodegas RE, Loma Larga and Quintay. And if you want to visit the historic port city Valparaíso, then Casa Higueras (www. casahigueras.cl), perched on the hillside with excellent views, is a sound option. Both Valparaíso and Casablanca were recently voted into the Great Wine Capitals Global Network, joining the likes of Bilbao/Rioja and Bordeaux. Moving south, Colchagua is by far the best equipped of Chile’s wine regions for visitors. This is partly the result of investment by local magnate Carlos Cardoen, who has set up various enterprises based around the valley’s informal capital Santa Cruz. These include the impressive Hotel Plaza Santa Cruz (hardly boutique at 116 rooms, but deserving of a mention), a casino, two museums (including one devoted to cars) and Viña Santa Cruz over the hills in Lolol, complete with cable cars, mini observatory for star-gazing and recreations of indigenous tribal settlements. There are several boutique wine hotels in Colchagua, perhaps the most impressive being the Lapostolle Residence, a luxurious and beautifully equipped Relais & Chateaux eyrie on the southfacing amphitheatre that is Apalta, a stone’s throw from the stunning deconstructed barrel design of the winery. Those of an active disposition can choose from cookery classes, horse or mountainbike rides, hikes, massages and the infinity pool. Prices are as steep as the hillsides here, but the standard is correspondingly high. Somewhat more traditional is the Hotel Viña La Playa in the west of Colchagua, and linked to Viña Sutil. While the wines may not be the best in the valley, and the location remote, the 11-room hotel is well appointed and tranquil, with its own landing strip, restaurant, pool and varied programmes, from sensory tastings to hot-air balloon trips. 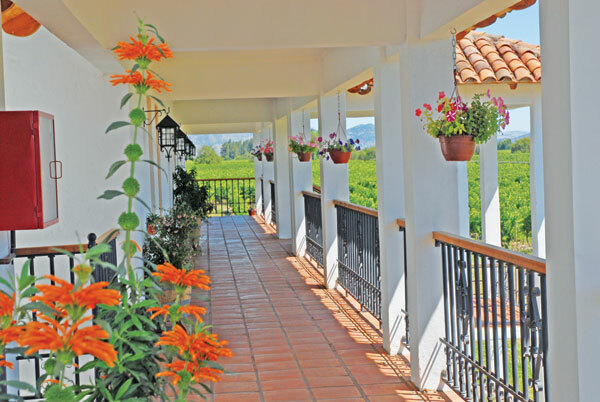 Other options in Colchagua include Casa Silva’s elegantly rendered boutique hotel and restaurant (complete with polo pitch) in the accessible eastern end of the valley near San Fernando, and the spacious and laid-back Hotel Casa de Campo, just outside Santa Cruz. Also in the centre of the valley, located in the vineyard of Laura Hartwig Winery, is Hotel TerraViña (pictured right), run by a Danish/Chilean couple. Though it’s only a B&B, co-owner Anne Sorensen says: ‘There are plenty of restaurants around us, and one next door, a short walk through the vineyard. We provide guests with a flashlight and our dog shows the way.’ Wineries to visit in Colchagua include Lapostolle, Montes, Emiliana Orgánico, Villalobos, Casa Silva, Cono Sur, Viu Manent, Luis Felipe Edwards and Polkura. Southern Chile is particularly exciting at the moment. A significant revival of old vines (Maule, Itata and Bío Bío were some of the first regions put to vine by Europeans in the 16th century) and exploration of new varieties and terroirs have re-energised the area. Notable wineries here include Erasmo (Reserva de Caliboro), Gillmore and Ribera del Lago. Tourism infrastructure has been slow to catch up, but one boutique wine guest house worth flagging up is Tabonkö. 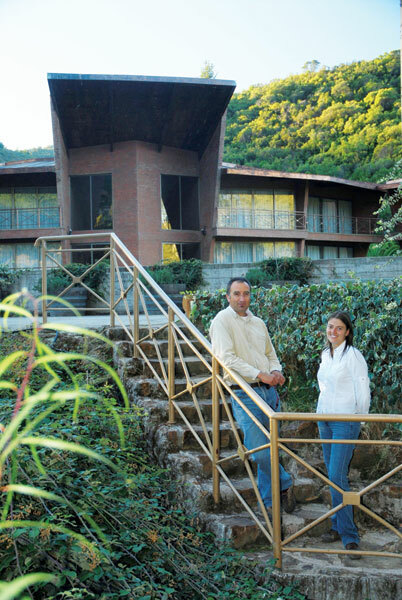 Run by husband-and-wife winemakers Andrés Sánchez and Daniella Gillmore (pictured left), and open from September to April, this handsome copper-and-wood hotel is located in splendid rural isolation at the Gillmore winery in the Loncomilla Valley (Maule). Despite the creature comforts, including jacuzzis and king-size beds, nature takes centre stage – from the vibrant wines to the wine therapies, beautiful surroundings and local fauna: native animals such as pudus, alpacas and ñandus wander around the site freely, and there’s also a small zoo. If nothing else, the night-time noises are something different.